When the correct alloy has been chosen for a specific environment, and it still rusts, then something has likely affected the surface of the material. Real-world fabrication, welding and handling of stainless steel components will leave surface contaminates. These contaminates, including weld oxides and embedded particles, hinder stainless steel’s natural ability to resist corrosion. Pickling and/or Passivation can remove these surface contaminates, and allow the material to perform as it is engineered. While not offering all of the benefits of electropolishing, chemical passivation will improve the corrosion resistance of stainless steel. The presence of exogenous surface contaminants may disrupt the formation of stainless steel's naturally corrosion-resistant surface layer. Surface contaminants, including grease, dirt, iron, and other metallic particles are inherent to the metal fabrication process. During a steel passivation treatment, the surface of a part is chemically treated by a mild oxidant. The chemical passivation treatment removes free iron and other foreign contaminants and promotes the formation of a chromium-rich corrosion resistant layer. Harrison Electropolishing has performed stainless steel passivation treatments with excellent results since 1980. We have the capacity to passivate stainless steel components of all sizes at our facility or a job site anywhere in the world. 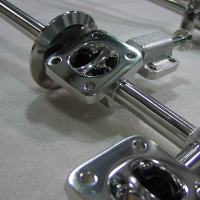 We can perform passivation treatments with nitric acid or citric acid. Harrison Electropolishing will perform chemical passivation treatments in compliance with ASTM specifications or your industry or company specific chemical passivation standard.